We are sitting in the Crystal bar, the log fire is roaring and the room is full of Saturday night diners. It is a very English winter scene. 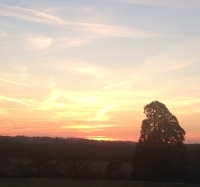 This morning we went for a final run around the park, running laps as the sun rose magnificently across the frosty frozen ground; we also went down to our big oak tree for a hug goodbye. As we approached the tree, a little, brown, sleek rocket came bolting towards us. A flash of speed. 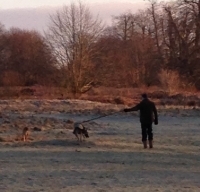 His master was following with another dog on a lead. Their master giving them both unconditional love. If we are always conscious of what we are putting into the 'space between'; if we are committed to taking responsibility for our part in any dialogue, then confidence builds in this space and the same uncomplicated open trust that is so often found between master and pet, can exist in the spaces between us all. Looking into Anadi's eyes is like looking into a still, deep, blue lake; we rested some more 'I wonder what is next...? I said as we started back up the hill to breakfast...' We are about to find out' Anadi replied. 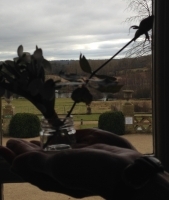 I enjoyed a delightful day engaging with clients and friends; Alison brought me a rose from her winter rose tree. Three Christmases ago she gave me a beautoulf perfect pink rose, and since then, as I have not been here for Christmas, she has sent me a photo from the 'Julia Tree'!